Skateboards are the toys of the most extreme, using which they satisfy their inner x factor urge. For people who like to live on the edge with skateboards, personalizing their skateboards is of great significance. Go Stickers have been providing outstanding quality stickers for a variety of purposes for decades and have the ability to offer Skateboard Stickers that are manufactured using the most advanced hybrid materials are printed through the most updated high-quality printing processes on the most high-tech equipment that make the prints look absolutely mesmerizing. Go Stickers can produce the simplest of designs and also the most complex multi-layered designs depending on the personal preferences of our clients. To put the cherry on the icing, we offer free delivery on bulk orders along with the cheapest wholesale prices for all our products. Pay for what you get, the printing plates and cutting die costs are ours to bear. When looking to customize or personalize your skateboard, Skateboard Stickers provide the most manageable option. Instead of painting them permanently in whatever styling you might prefer, pasting Skateboard Stickers on them instead that are manufactured from waterproof and all kinds of weatherproof materials and use adhesives that even don’t leave any kind of a residue when removed, is a much more preferred option by numerous skateboard lovers. 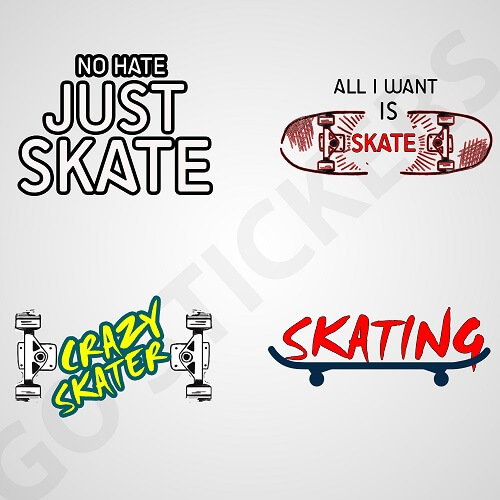 Go Stickers provide stickers for skateboards that come in numerous color, size and personalization options and are the easiest to both stick on and take off. With decades of experience behind us and using our highly dependable sourcing and manufacturing channels, Go Stickers are able to eliminate all the un-necessary costs. This allows us to offer our clients the most reliable Wholesale Skateboard Stickers at the cheapest bulk prices in the whole industry. 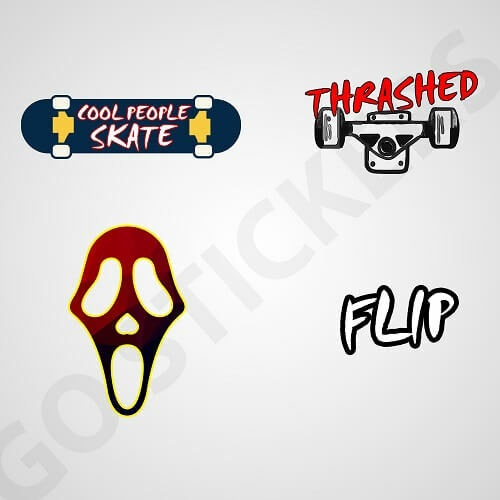 We achieve the super cheap prices through effective techniques that don’t compromise on the quality of our Custom Skateboard Stickers by any stretch of the imagination and provide complete satisfaction when it comes to both their quality and cheapest prices. When it comes to designing the Custom Skateboard Stickers, Go Stickers utilize our top designers and state-of-the-art cutting die equipment in combination with the most advanced printing equipment that allows us to produce some of the fanciest and unique designs for our personalized Skateboard Stickers. Regardless of if you prefer zombies, Santa Cruz, any other specific hot girls, any specific company logo or brand names or even the coolest skulls and superhero stickers for your skateboards, Go Stickers will provide you with the most suitable option in the industry. 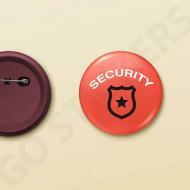 Our designs are the sharpest in quality and are completely pixels free in terms of their high definition finish. Go Stickers are well known in the market for using only the highest quality raw materials for all our products. Custom Skateboard Stickers are no different. We use the highest quality hybrid materials that enable our custom stickers to come out with the finest quality finish that has all the water and dust proof capabilities along with the strongest adhesive stick that will not come off until it is removed intentionally. The highly personalized Skateboard Stickers from Go Stickers being manufactured from the highest quality materials and longest lasting inks are able to keep their finest finish shine or matt look for the longest periods of time and will keep your high-quality skateboard looking good as new for as long as you don’t remove our Custom Skateboard Stickers by yourself. 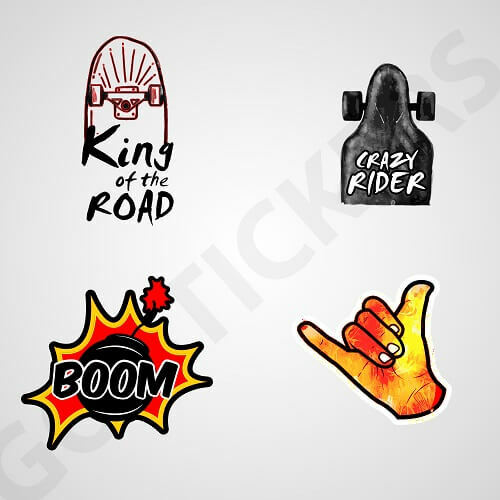 Looking for the best wholesale offers on the highest level Custom Skateboard Stickers that have the most dependable longest lasting and environment proof features in the industry, you cant go wrong with Go Stickers at all. We will provide you with the cheapest bulk prices and free delivery on bulk orders at the same time as well. We facilitate our clients by taking extra costs like the printing plate or the cutting die costs upon us as well and aim to maximize their profit margins and provide sustainable growth for both them and ourselves.